In recognition of continued contributions to energy research, the development of a $320 million business complex, and an investment into future jobs creation in Camden City, the Walter Rand Institute for Public Affairs is honoring Dr. Kris Singh—Founder, President and CEO of Holtec International—as its Private Sector South Jerseyan of the Year on Thursday, May 4th at the 16th Annual Walter and Leah Rand Awards Scholarship Dinner. Dr. Sighn’s commitment to building and working in Camden is driven by a strong ethical vision and he is confident the Holtec site, “…will be ground zero for the renaissance of manufacturing in America.” Originally announced in 2014, the development of Holtec’s Technology Campus in South Camden has already provided economic benefit to the city, as the company purposefully hires local contractors and does business with area vendors. Engineers and other employees from Holtec’s Marlton site have begun to relocate to the city and manufacturing operations, once scheduled for early 2018, will likely begin before the year’s end. In the interim, Holtec is developing curriculum for local high schools and colleges to train up the next generation of manufacturing professionals. A widely published author in scientific journals (with over 70 technical papers, one textbook and numerous symposia volumes) and a prolific inventor (with over 60 patents), Dr. Singh has led Holtec International since the company’s inception, building it up to a technological powerhouse respected for its engineered goods and services around the world with nine major operations centers in three countries and an active business presence on four continents. Over 120 nuclear plants around the world employ Holtec’s systems and equipment in safety-significant applications, many based on Dr. Singh’s patents. In keeping with its reputation as the nation’s premier energy technology innovator, Holtec International is the world’s only energy company engaged in the global technology race to develop a “walk away safe” small modular reactor without relying on any government subsidies. 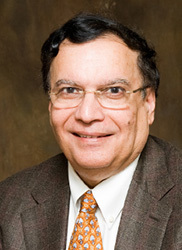 Dr. Singh received his Ph.D. in Mechanical Engineering from the University of Pennsylvania (1972), a Masters in Engineering Mechanics also from Penn (1969), and B.S. in Mechanical Engineering from BIT Sindri (Ranchi University), India (1967). Dr. Singh was elected to the National Academy of Engineering in 2013 for his seminal impact in the energy sector of mechanical engineering and a Fellow of the American Society of Mechanical Engineers in 1987 for his numerous contributions to heat exchange technologies. He is a registered Professional Engineer in Pennsylvania (1974) and Michigan (1982). Dr. Singh serves on the following boards: Board of Trustees of the University of Pennsylvania, Board of Overseers of the University’s School of Engineering and Applied Science, Board of Trustees of the Cooper Health System based in Camden, New Jersey, Board of Directors of the Nuclear Energy Institute, Board of Directors of Holtec International (Chairman), and Board of Directors of the KPS Charitable Foundation (Chairman). The Foundation’s signature accomplishment is the opening of the Krishna P. Singh Center for Nanotechnology at the University of Pennsylvania in 2013. Page last updated by Senator Walter Rand Institute for Public Affairs at 10:33 am April 20, 2017 . This page was printed from http://rand.camden.rutgers.edu/2017/03/21/singh-corporate-sector/ at 4:06 PM Monday, April 22, 2019.